Today is our founder, Mrs. Ruth Datzyk's, 94th birthday. For 70 of those 94 years, she was a teacher. 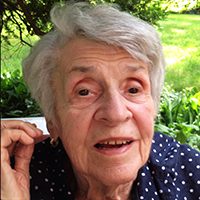 For nearly 50 of them, she taught in her own school, the Datzyk Montessori School. Mrs. Datzyk has inspired thousands of people, children and adults alike, during her career. Following in her footsteps are the current DMS staff, who are excited to be attending the annual American Montessori Society Conference in Philadelphia this weekend. Please join us in wishing Mrs. Datzyk the happiest of birthdays - we invite you to send or deliver birthday cards to Mrs. Turrisi's attention at the school (3300 Broadway, Allentown, PA 18104), or by email (lturrisi@datzyk.org). It always means a lot to Mrs. Datzyk to hear from the many people upon whose lives she's made an impact.